This is Part Three of my unintended series about “new-to-me” finds in our archives. Ledgers from the 1800s and early 1900s look alike when they are on a bookshelf. (They are also stored on lower shelves and I don’t bend over to examine things as well as I did when I began this job.) They are similar height, have reinforced binding, and have gold “Register” or “Ledger” on the spine. This month’s find had “War of 1917-1919” on the lower spine. It was made by Humphrey Press on Pulteney Street. Before Microsoft Excel spreadsheets every business and organization needed ledgers and Humphrey made them to order. This one had two pages of columns for each soldier. There is no preface about who assembled or verified the information. Different hands wrote the information and many different units and branches of service are recorded. Only survivors are entered in the ledger and compared to other sources it’s obvious that these were not all the men (and none of the women) from Geneva who served. Those questions aside, the ledger has great information. Based on birth dates I guess these three men to be first-generation Americans. They all entered service on July 26, 1918 and remained at Camp Dix until the end of the war. Achilles Anania, founder of the modern Geneva Club Beverage Company, served on the Western Front in France. Many Genevans saw action along the Germans’ Hindenburg Line, as noted in small writing on Private First Class Anania’s service record. It was thought to be impenetrable but was not and that defeat turned the tide of the war. The 1918 influenza pandemic began in a US Army camp and the illness was spread by troops who were in close quarters and were moved around frequently. 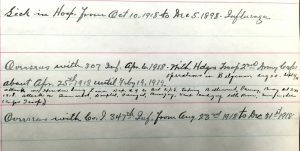 The ledger notes soldiers who were in the hospital with influenza. Many were there for weeks and didn’t return to service after recovery. There is at least one story of luck in the book, if you know your historical dates. Armistice was declared November 11, 1918 while Private Cook was on the Atlantic Ocean. The ship was sent home before it reached Europe. Like many ledgers this one had far more pages than were used. There were index pages but they were not completely filled out. If you wonder if a relative is entered in the ledger, contact us and we can look for you. Better yet, if you’d like to index and possibly scan the ledger, contact our volunteer coordinator Jeanine Houseman and we can put you to work! Please add Harold Nester – he fought in World War I. 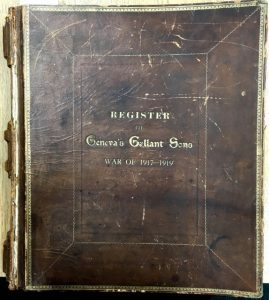 This 100 year old ledger is great resource. Enjoyed this very timely article.. Thanks for sharing.